1. Elegant and beautiful shape room lighting. 2. Matte black metal cage design. 3. Green and environmentally friendly, is conducive to recycling. 4. Not only a durable and safe pendant light, but also a nice light decoration, for home, bar and restaurant and so on. This simple modern metal pendant light will brighten up your living space, suitable for bedroom, entrance,dinning room, dining room,cafe, restaurants or office. 1. For any reason, if you are not satisfied with the item, You can return it in the original package within 15 working days after receiving the item. 2. Who pays the shipping fees depends on the reason for returning. If it is the buyer's fault, buyer need to pay the return shipping fees. 3. The returned item must be back in factory condition: non-defective, undamaged. ★(Big Sale!) 2-Pack vintage edison ceiling pendant light, E26/E27 Base,110V, Wattage: 60W, Lampshade Material: Aluminum. Bulb is NOT included. ☆High quality loft pendant light, products through the CE, VDE, UL, LVD, SAA certification. ★Black Wire cage lamp guard: the surface after advanced, low carbon environmental protection paint non-toxic, no rust, color uniform durability. ☆About 110 cm length cable line, Instead of the light that was attached to the ceiling, you can make the pendant light hang lower to your area, more closer to feel the beauty of the light. 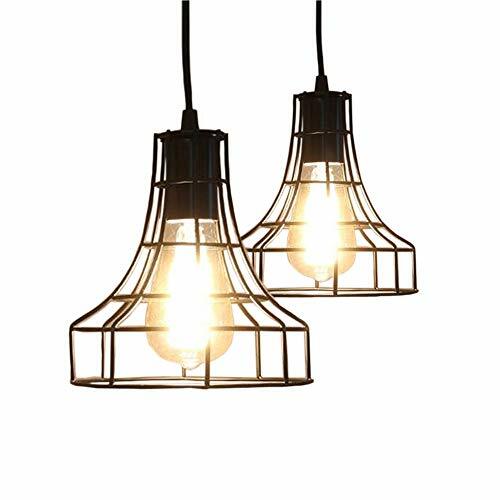 ★Metal basket cage pendant light shade, suitable for different styles: Country, Modern, Retro,Loft, Antique. Perfect for kitchen/dining room/bedroom/cafe/bar/hotel/club lighting Deco. If you have any questions about this product by Chrasy, contact us by completing and submitting the form below. If you are looking for a specif part number, please include it with your message.